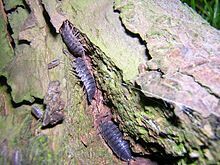 A sow bug or woodlouse is a small land arthropod (jointed-legged animal). They are often confused with centipedes, millipedes or insects, but are actually crustaceans. They have fourteen legs and breathe through gills. Because of the gills, woodlice need water in the air around them. They mostly eat dead plants, and are considered helpful, because they act as "garbage collectors." Some species can roll up into a ball when in danger. In such position, their hard shell faces out, protecting the softer parts of the body. Sow bugs do not look like shrimps or crabs, although they are closely related. This page was last changed on 25 September 2018, at 07:18.